While the feud between Shawn Michaels and The Undertaker was short, it was important in adding a new rivalry. One important match from the Attitude Era was the WWF Championship match between Bret Hart and the then champion The Undertaker with Shawn Michaels as the special guest referee at Summerslam 1997. It had been put into the contract what Hart stated verbally, if Bret Hart had lost, he would never compete in the United States again. WWF officials would later shock the WWF Universe by making Shawn Michaels the referee and putting into the contract that if Michaels didn't call the match fairly he would never be allowed to wrestle in the United States either. During the match Bret Hart knocked out Michaels and took advantage by hitting Undertaker with a steel chair attempt, while Hart attempted the pin, Michaels stopped counting when he saw the chair. Hart and Michaels got into and arguement in ring. As Michaels went to hit Hart with the chair, Hart would dodge resulting in Michaels hitting The Undertaker (who was just getting to his feet). Michaels counted the pinfall and worried, that the Undertaker (who blamed Michaels for the loss of the WWF Championship) brought in his "insurance policy" (Triple H and Chyna, later to be later know as D-Generation X). While The Undertaker said that Michaels would "pay for his crimes" Michaels would repeat his SummerSlam actions during a tag team match between DX and The Undertaker and Mankind, getting himself disqualified by hitting The Undertaker with a chair. This led to the first ever Hell in a Cell Match. While it seemed as thought Undertaker would win, The Undertaker's younger, half-brother, Kane (that Paul Bearer had spoken of) ripped the door of the cell and peformed the Tombstone Piledriver on his half-brother costing him the match. This led to the The Brothers of Destruction Saga. Michaels and Undertaker would meet again 3 months afterwards at the Royal Rumble in a Casket Match. Two infamous moments occured during that match would change the complexity of not only the Brother of Destruction Saga, but the WWF. During the first several minuets of the match, Undertaker would launch Michaels over the top rope and onto the edge of the casket, damaging Michaels' back and putting him out of in ring action for the next four years. Kane would later on interfere in the match on what was thought to be on the Undertaker's behalf but instead aided Michaels, by chokeslamming Undertaker in the casket, closing it shut, and set it on fire with the help of Paul Bearer. Later in the 2000's the rivarly would reignite as Shawn Michaels and The Undertaker put on two of the greatest WrestleMania Performances of all time at WrestleMania 25 and 26. As the rivarly got reformed after Shawn Michaels would want to make it known that he was the enity of WrestleMania and not The Undertaker who was 20-0 at WrestleMania. 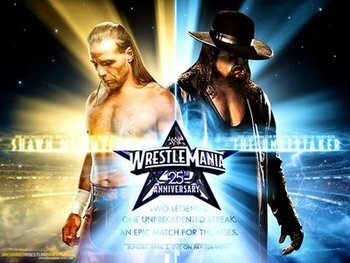 After losing at WrestleMania the jealously and resentment got to Shawn Michaels and told The Undertaker he would put up his career at WrestleMania 26 for one more chance to end the streak of The Undertaker. Undertaker would end up ending Shawn Michaels career in 2010 and that was the last time we seen Shawn Michaels in the WWE ring this feud will last forever as meaningful part not just for the WWE but professional wreslting as a whole.